Trace Adkins, Alabama, Gregg Allman et al. On one special night last November, an extraordinary collection of artists came together at the historic Fox Theatre in Atlanta, GA to perform and celebrate the songs of Lynyrd Skynyrd, one of the most influential bands of our time. This unique concert event centred around performances by Lynyrd Skynyrd, including a special rendition of “Travelin' Man” with Johnny Van Zant singing along with an archival video of his late brother, Ronnie performing, as well as a rousing rendition of “Sweet Home Alabama” with Skynyrd inviting the entire star-studded line-up up on stage to perform alongside them. “One More For The Fans” features performances by Lynyrd Skynyrd as well as music legends and young talent, culled from multiple genres including Classic Rock, Country and Americana with Gregg Allman, Trace Adkins, Alabama, Blackberry Smoke, Cheap Trick, Charlie Daniels, Peter Frampton, Gov't Mule, Warren Haynes, John Hiatt, Randy Houser, Jason Isbell, Jamey Johnson, Aaron Lewis, moe., O.A.R., Robert Randolph and Donnie Van Zant all coming together to perform songs from Lynyrd Skynyrd's extensive catalog of music. 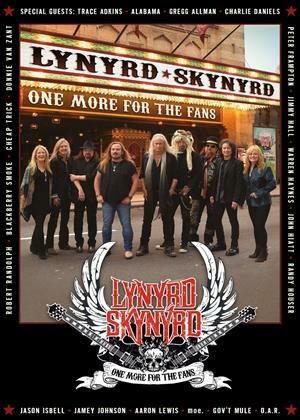 As part of the campaign to save the Fox Theatre from demolition, Lynyrd Skynyrd recorded their 1976 live album, “One More From The Road”, at the landmark theatre. The title “Lynyrd Skynyrd - One More For The Fans” was inspired by that legendary album's title. Hearing all of these incredible musician perform Lynyrd Skynyrd classics surely makes this night unfortgettable for both fans and Lynyrd Skynyrd themselves.